I am sure you all remember the ant and the grasshopper story that was told to you when you were young. Well, I can say that I am an ant. We heat our home with a wood stove. I am grateful for this considering the price of heating oil now. 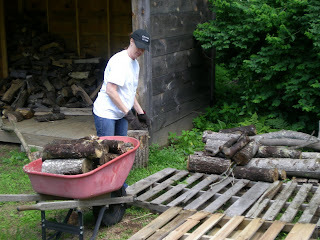 Since, we have around three acres we have enough wood to do this without buying any. But we have to cut, spit and stack the wood. 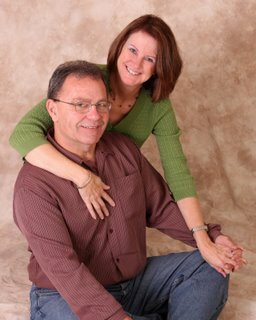 Here are pictures of Jim and I being the ant. The beginning of the pile of wood to split. 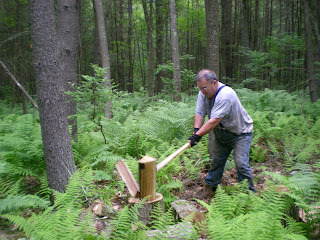 Jim through out the fall of last year cut down several trees out in the woods. 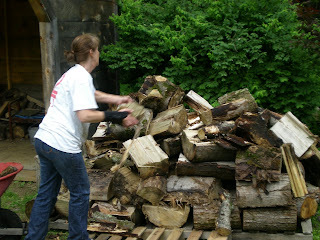 Now we need to bring them to the wood shed to split and stack. We still had some wood left over from last year so we do have a head start of this next year. The end of day one. 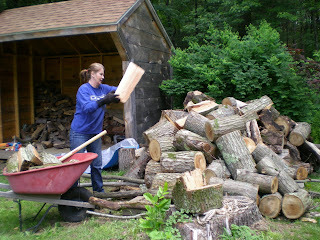 I hauled most of this wood, while Jim cut down some more trees. Some of the pieces of trees where to big and Jim had to split them before hauling them out. I had to try my hand at splitting them. Jim started it for me so I could have a better chance at splitting it but still no love. So I will leave the splitting to him and I will do the hauling. The end of day two. We have still about seven more days of hauling and then it will be time to split and stack. It all needs to be done by the middle of July so that it will be dry by next winter. It is a lot of work but I will enjoy being warm when it snows outside. I will keep you posted on our progress and the end result. Looks like life in good old Deer Park. 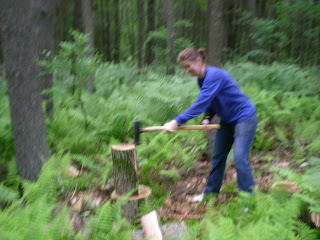 We spent many a time out getting fire wood. Seems like this area is treating you great. That looks like crazy hard work. Who knew you had to have it so long so it would be dry. I was just thinking you were doing it now so you wouldn't have to do it in the snow. Shows how much I know about being a mountain woman. You look like a natural out there moving wood around. I think I will stick to my walking over to the central heat and turning up the knob. :) We do have a fireplace and we have a little wood. Just for fun though.